Narcissa was based on a mix of Juliet Landau (who will always be Bellatrix in my mind) and Jenny Agutter. Lucius is of course Jason Isaacs and Draco a slightly aged up Tom Felton. *goggles* Astounding. The level of detail is exceptional. I love the color scheme and the facial expressions! Wow, that's great. I love the details as well. oh wow... Thats simply amazing. Its so detailed and accurate. And Narcissa is perfect, just as I imagined her to be. I never thought of Juliet Landau as Bellatrix, but it really fits... ^_^ Beautiful job. What a great drawing. I think you've captured the family very well. I love the detail (especially on the robes) and the expressions are just about perfect. this is great. You're Lucius and Draco are absolutely lifelike. So's your Narcissa, she reminds me of one of the life coaches on Starting Over. Great job. Oh - wonderful, haughty look around Lucius's mouth; they all have a fantastic superior look. Really nice portrait! I'm usually not one for the Malfoys but Guh. They are all so beautiful and arrogant. And I loooove the details on their robes, they look very expensive and classy. Great job! Brilliant, as always! I love the little details you've put in here, like the embellishment on the collars for the men and on the decollatage of Narcissa's top. I still marvel that you do this with markers; it's so clean-looking! 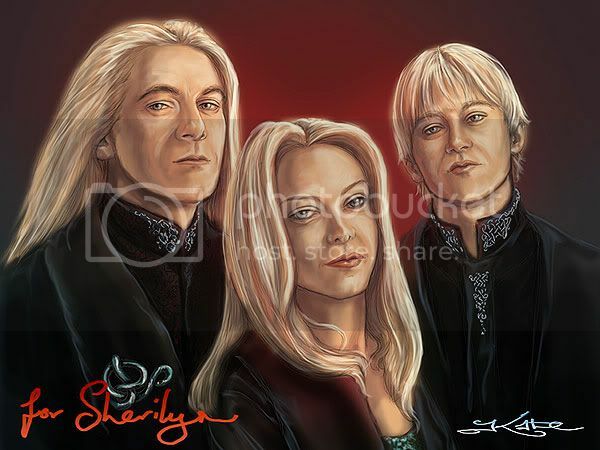 BTW, am adding this pic to my Narcissa rec page as I adore your interpretation of her here! This pic was not done with Markers - this one was done in PhotoShop. JESUS CHRIST. Here's a medal! :O Good effing job!